Indiana’s French past is at the heart of Great Lakes history. LaSalle reached the area of present-day South Bend in 1679. A trading post near Vincennes was established in 1702 by Sieur Juchereau, a year after Cadillac came ashore along the Rivière du Détroit. French Canadians and Metis from throughout the Great Lakes region can trace family history to this early settlement. Indiana native Joy Biggs discovered her own links to Vincennes’ storied past through small clues in unexpected places.—ed. When reflecting back on my childhood, and when I first learned the history of Vincennes, Indiana, at some point I realized that it was from my mother Norma that I learned so much. Indeed, it was her love of history and Vincennes that has had the most influence on me. She also had family stories. For example, she had a story that we were part Indian and we had a French fur trader in the family. It was much later in life that I became interested in my family history. By then it was too late to talk to my great aunts, and I could no longer ask my mother the many questions I have still today. 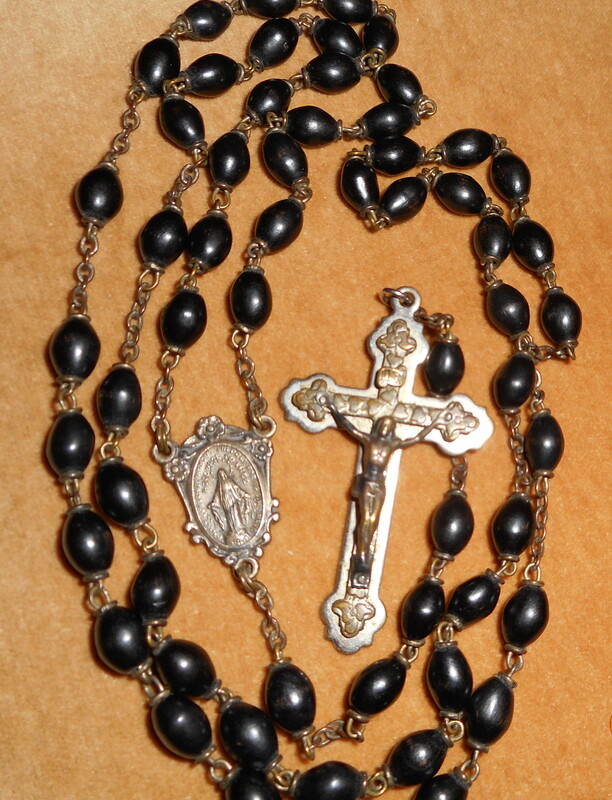 Several years ago, I received an old rosary and a Catholic medallion that had been in my mother’s family. I was curious about them and I got a magnifying glass to read the date on these small family heirlooms. I was amazed that it said 1830! I started wondering who had owned these…who had used and worn these precious religious objects? Then and there I started on a mission to find the answer. Fast-forward a few years…I recently discovered through the help of our local priest that the 1830 refers to the year of the apparition that the medal commemorates — not when they were made. These objects nevertheless hold a special place in my heart and in my family. And they were an important catalyst: they helped inspire my search for my ancestors! I started looking at old obituaries. The one of my great-grandmother Nora Shappard Hobson, was very interesting and provided a new clue. I found a name that I did not know: that of her mother, my great-great grandmother, whose name was Emilie Carie Shappard. I remember my mother telling me about the Shappards, but I had never heard of the name Carie. But then something clicked in my memory. I had my mother’s worn paperback copy of the book Old Vincennes. I had read it before, but now I began to closely study it. I came to love this book by Joseph Henry Vanderburgh Somes. He gives detailed information of the French period and about Vincennes over many generations. I found there a story about Nicholas Chapard, 2nd commandant of the old Poste Vincennes from 1765 to 1770. I read with interest and when I turned the page found this: “his descendants, still in Vincennes, usually spell their name as Shappard”— the exact same spelling as my great-great grandmother’s name! There is also a small street named after him in Vincennes — Nicholas Street, near Good Samaritan Hospital. I also read about Pierre Tieri de Frontenac. It says that, in the early days, Tieri owned the site of the old lock and dam near Mt. Carmel, Illinois, which was the site of their fur trading post. Furthermore, I discovered that Tieri was also known as Queret. This name was corrupted in spelling and pronunciation to Carie! At last, this might be my fur trader. These are the two names that are in my family. With the help of the Vincennes Historical Library, and the local branch of the Daughters of the American Revolution, I was introduced to the extensive records of St. Francis Xavier Catholic Church in Vincennes. These records go back to the early 1700’s. Here in black and white, I found my French families and was able to trace their history in more and more detail. They traveled from Canada, settled here in Vincennes, only a few miles from my current home. It is amazing how a small detail from one ancestor has led me to many ancestors. I love finding any story about them, no matter how small. All information is a treasure. With my new discoveries, I felt like I won the lottery of French ancestors! The stories my mother told me were proven to be true, and how I wish I could tell her. And it was a couple of small, family treasures in the form of a medallion and an old rosary, which led me down the path of discovery. I, too, am a descendent ofNicholas Chappard. We are descended through Mary Ann and Barbara sheppard. I believe barbara married Landelin Wetzel. i would have to consult my genealogy records for exact info, but I have also traced some early Vincennes ancestors to the first settlers of Quebec. So interesting!